Line counter rods are a great tool for any fisherman who is looking to start trolling. Rather than manually count various fishing line depths, line counter rods and reels will do the work for you. Combining a line counter rod with ﻿﻿﻿t﻿﻿he ﻿right ﻿﻿﻿ree﻿﻿﻿l results in accurate depth measurements, making it easier to maintain patterns. 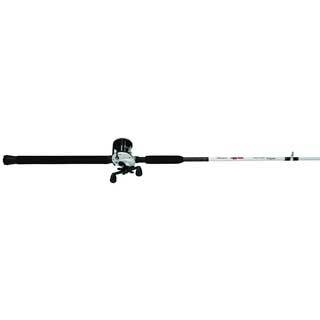 Line counter rods and reels work together to make trolling much more efficient and enjoyable overall. To be properly mounted and used, line counters require a solid line counter rod. While trolling can certainly be accomplished without a line counter rod, the most efficient method for trolling will always include a line counter rod. Many of these trolling rods come in line counter rod and reel combinations, making utilizing these features simple and accessible. Locating the best line counter rods can certainly be difficult. There are tons of options to choose from, and it can be hard to determine which rod is best suited as a line counter rod. This review strives to make the process much easier for fishermen who are considering a line counter rod. The following list includes a detailed analysis of the best line counter reels that are currently available. Whether it is a standalone rod or a rod and reel combo, each one of these rods has been awarded consistently high praise for performance and functionality. As a result, these are the best line counter rods to consider investing in. With its patented Ugly Stik clear tip design, the Shakespeare Ugly Stik Striper Round rod and reel combo is one of the most durable and efficient line counter rods available. The combination of Ugly Tech construction and Ugly Tuff components create a thoroughly solid rod that promises to hold up underneath heavy pressure and heavy weight. The large, 20 size line counter reel allows for greater stocks of fishing line, which allows for greater depths when trolling. The line counter function allows for fishermen to keep track of each and every depth so that beneficial fishing patterns can be easily replicated. A great feature of this combo is that there is an adjustable bait clicker. Fishermen can choose to turn the bait clicker function on or off, resulting in a fishing experience that is closely catered to individual preferences. Okuma has long been a trust manufacturing name for fishing equipment, and this rod and reel combo is one of their most versatile models yet. Suitable for freshwater or saltwater application, this rod and reel combo can withstand wear and tear from any fishing environment, a rare quality in line counter rods. The durable E-glass blank construction keeps the line counter rod rigid and intact, even when under heavy pressure. This line counter rod also features stainless steel hooded reel seats and double footed aluminum oxide guides to ensure that the reel and fishing line stays intact. All three models come with an attached line counter to ensure that depths are always accurately measured, making for an overall efficient trolling experience. The Vendetta Line Counter Rod from Abu Garcia is made specifically for trolling anglers and is perfectly suited to match up with the Alphamar LC Syncro line counter reels. The graphite blank provides a lightweight, balanced design for handheld or rod stand application. 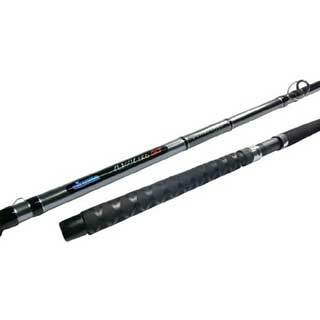 The rod itself features a sensitive tip for fighting fish, yet keeps a strong and sturdy backbone to ensure durability. The high-density EVA grips allow for greater sensitivity and increased durability, allowing for a firm grasp even under the wettest of conditions. One of the greatest aspects of the Vendetta Line Counter rod is that it comes with extended foregrips. The longer foregrips allow anglers to have the highest level of control and leverage when bringing in tough fish species, making this model an incredibly effective line counter rod. With multiple models to choose from ranging between 8 and 10 feet, trolling anglers will undoubtedly find the perfect Vendetta Line Counter rod for them. Experienced anglers will likely find no surprise at seeing multiple Shakespeare Ugly Stik models in the top-rated line counter rods. The Ugly Stik line has a long history of high performance and this line counter rod and reel combo is no different. The 20 size line counter reel features 2 ball bearings and an adjustable bait clicker. The patented Ugly Stik clear tip provides enhanced sensitivity, making it easier for anglers to see and feel the pull of a biting fish. The one-piece stainless steel guides work to enhance the overall durability of the rod, working to ensure that the fishing line stays in place even throughout the toughest of battles. Comfortable EVA grips with rubber gimbal help keep this catfish rod where it belongs, firmly and safely within your hands. When struggling to bring in a heavy fish, this feature proves to be particularly important. The EVA foam is not only comfortable to hold, but it resists becoming slick and slippery when splashed with water. Okuma is well-known for offering high quality at affordable prices, and their Classic Pro rod is certainly no different. The blank is constructed of fiberglass, offering a combination of durability and lighter overall weight. Reviews rave about the ability of this line counter rod to withstand heavy pressure and weight. The Classic rods also feature a combination of aluminum oxide and stainless steel with line guides, foot guides, and the reel seat. These additional features are just as sturdy as they are durable, promising to withstand even the toughest of fights. The Classic Pro comes from a dependable line of rods, making for a thoroughly worthwhile trolling and line counter rod. 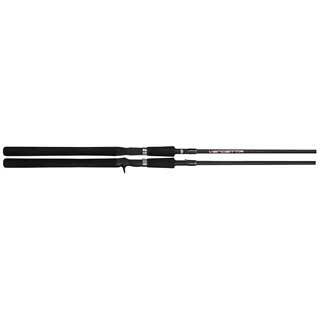 Designed to fit Okuma’s popular Star Drag and Line Counter reels, the Classic Pro Downrigger rod is the perfect fit for Okuma’s trolling reels. When looking for the best line counter rod, there are a few key elements that a line counter rod should have. Just as with any form of fishing, there are certain techniques and abilities that will be supported by these key elements. Make sure to keep these elements in mind, as they will help separate mediocre line counter rods from the best line counter rods. Whether you are looking to purchase a rod and reel combo, or if you prefer to use your own line counter reel, you’ll need to keep the reel in mind when looking for the rod. To provide the most efficient performance, both components need to work together. Line counter rod and reel combos are beneficial because they eliminate the added stress or effort in finding the right line counter reel. These combos are already formatted to work perfectly together. For some anglers, the best—and most convenient—way to buy a line counter rod is to purchase a combo which includes a line counter reel. For the standalone rods, however, it is important to pay attention to the reel that you attach. Even though they don’t come as a packaged deal, some line counter rods are specially formatted to work best with a specific line counter reel model. Since line counter rods are structured around the accurate dispersal and tracking of fishing line, the line guides will also be important. 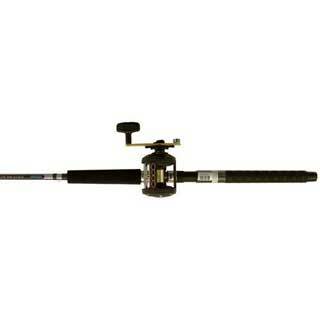 Just like with trolling rods, the guides will fluctuate between standard or roller guides. Depending upon the environment you will be in and the type of fish you are trolling for, line guides can play a big part in determining how efficient the line counter function will be. Standard line guides are the most common, and they are suitable for small or medium-sized fish. For larger fish, however, anglers will want to look for roller guides. These guides will create less friction on the fishing line. Decreased pressure on the line will increase your control when bringing in a large fish, which will certainly result in a better fishing experience overall. A line counter rod can be an incredibly useful tool for anglers looking to spend their days trolling on quiet bodies of water. These rods come equipped with all the strength and features of trolling rods, with the extra addition of line counter features. Whether you decide upon a line counter rod and reel combo, or a standalone line counter rod, line counter rods serve to make trolling much more efficient and enjoyable. Often, looking for the best line counter rods means taking an in-depth look at the top-rated rods. By examining line counter rods that have high feedback for durability, strength, and performance, anglers can easily find the best line counter rods for them.